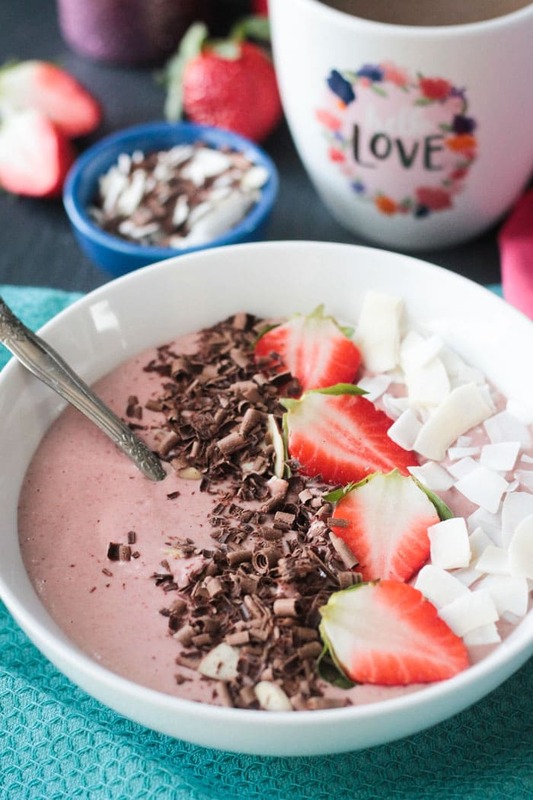 Chocolate Covered Strawberry Smoothie Bowl – this quick and easy smoothie bowl will have you thinking you’re eating dessert for breakfast….but it’s actually healthy! Happy Valentine’s Day! Today’s recipe works perfectly as a gorgeous holiday breakfast. And even though it’s healthy, it tastes decadent and could even double as a dessert. But the best part, is that it’s actually perfect for any ol’ day! It comes together in under 5 minutes and you can customize the toppings to your liking. 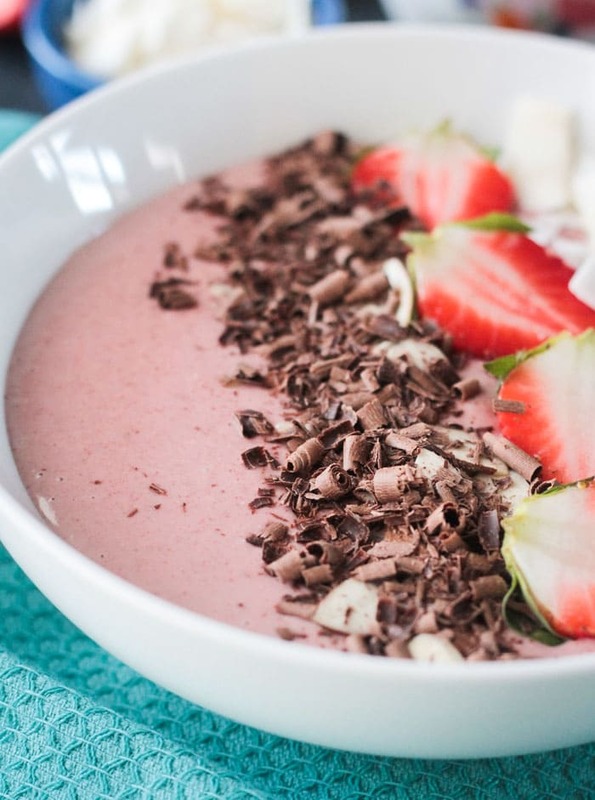 So, who’s ready for a Chocolate Covered Strawberry Smoothie Bowl?! If you can make a smoothie, you can make a smoothie bowl. There really isn’t much difference except the vessel you serve it in – glass vs. bowl – and the utensil you use to get it in your mouth – straw vs. spoon. (Is a straw considered a utensil? We’ll just say it is). If you like your smoothies on the thinner side, you may want to thicken it up it for bowl status. What really makes a smoothie bowl different from a smoothie are the toppings! In this Chocolate Covered Strawberry Smoothie Bowl, I went with fresh strawberries, coconut flakes, sliced almonds, and dark chocolate shavings. I know I told you up above that the best part of this recipe is that it works for any day of the week, not just today’s holiday, but truly the best part is that it’s all for you! This recipe serves just one! Of course, you could double it up and serve two if you wish, but I’m giving you permission to allow yourself to enjoy a little something just for you. You deserve it! You see those beautiful little curls of dark chocolate? Yeah, those aren’t optional. 🙂 Without them, we would just have a Strawberry Smoothie Bowl. Which is actually delicious in itself, but come on! It’s Valentine’s Day – we need our chocolate fix! A vegetable peeler and a good quality dark chocolate bar is all you need to make those cute little chocolate curls. But but but, chocolate chips would work fine in a pinch as well. This dairy free bowl of goodness is creamy, thick, delicious, and decadent. 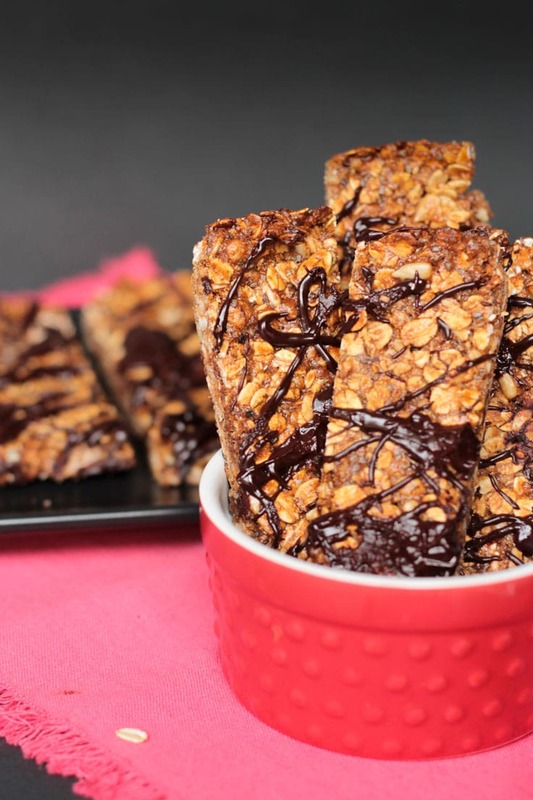 It tastes like dessert, but go ahead and indulge because it’s actually healthy! It has protein, fiber, healthy fats, vitamins, and minerals. It’s also, gluten free, oil free, and sugar free – sweetened only with fruit. 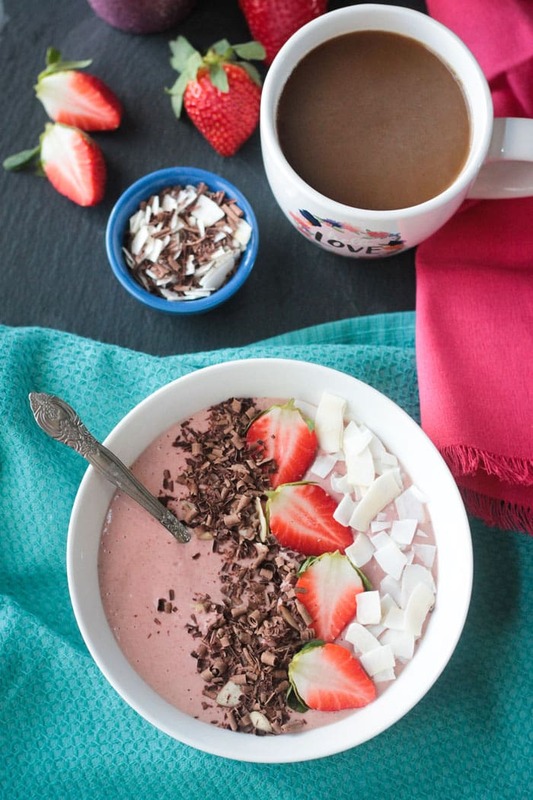 Who’s ready for Chocolate Covered Strawberry Smoothie Bowl? I hope you love this easy Smoothie Bowl as much as we do (because of course my kids had to get in on this chocolate strawberry action)! If you try it, please come back and leave me a comment below with your feedback and star rating. You can also find me on social media. Be sure to tag @veggie_inspired and #veggieinspired so I’m sure to see it! Enjoy! 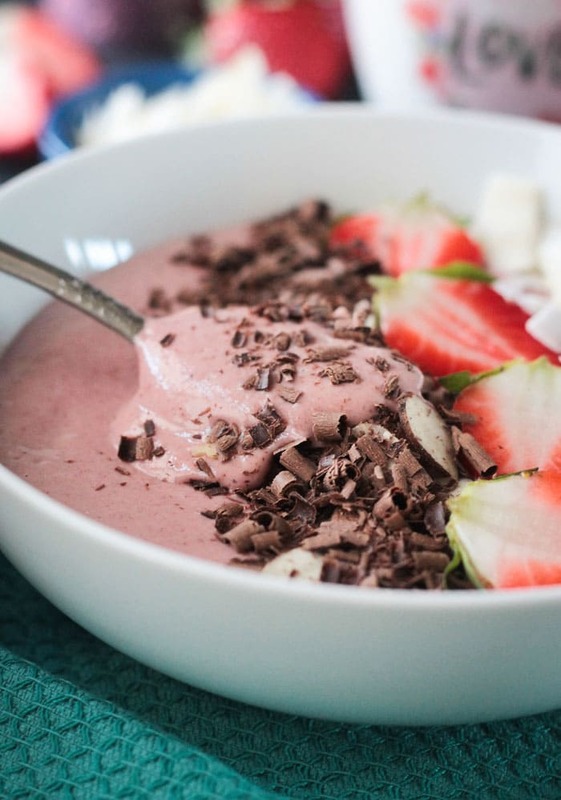 Chocolate Covered Strawberry Smoothie Bowl - this quick and easy smoothie bowl will have you thinking you're eating dessert for breakfast....but it's actually healthy! Place all the ingredients for the smoothie in a high speed blender and blend until smooth. Pour the smoothie into a bowl and add toppings of your choice. *Use a vegetable peeler to shave curls off of a dairy dark chocolate bar. Feel free to add any other topping you like. This is a gorgeous smoothie bowl! I see so many smoothie bowls on Instagram but they are always sooo over the top and overly filled and yours looks just perfect. Strawberries and chocolate, simple and just the best to me. I’ve never had a smoothie bowl before, I don’t really drink them either, but I’m pretty sure this would totally be a big hit with Olivia. She loves smoothies and ice cream! Oh, I totally know what you mean. Half of the ingredients in those bowls are inedible it seems. This was totally like eating ice cream with toppings…but healthy! Thanks, Brandi! Thanks, Sina! It’s so fun to add all the toppings! 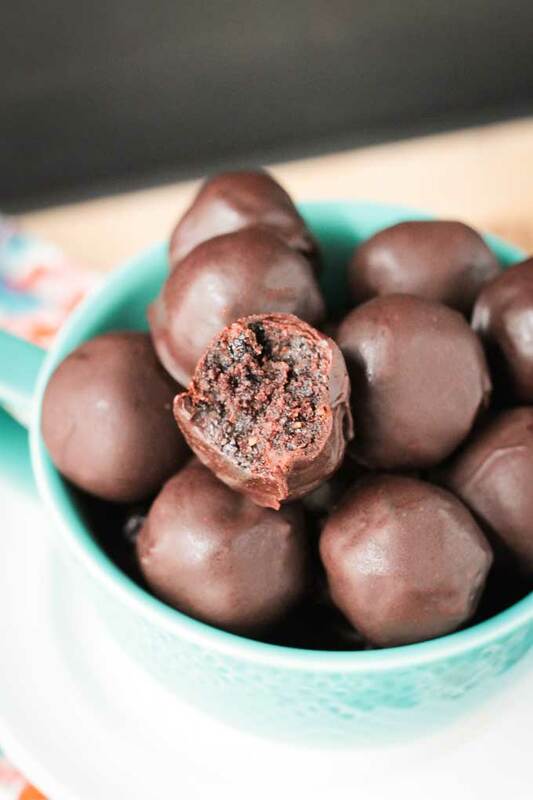 Chocolate covered strawberry anything really…so a bowl it is! I’m getting back into my bowls lately too! 🙂 They are a little more substantial than a smoothie because of all the toppings! HaHa! Depends on the day, Linda! What a lovely way to start the day. It’s such a pretty colour and with the oats and cashew butter, plus toppings, it will keep you going for hours. I find smoothie bowls much more satisfying than a regular smoothie because of the toppings! Yes, totally agree. It’s all about the toppings! This smoothie bowl looks to die for Jenn! Stunning and everyday ingredients. I’m on this one! This looks simply delicious! 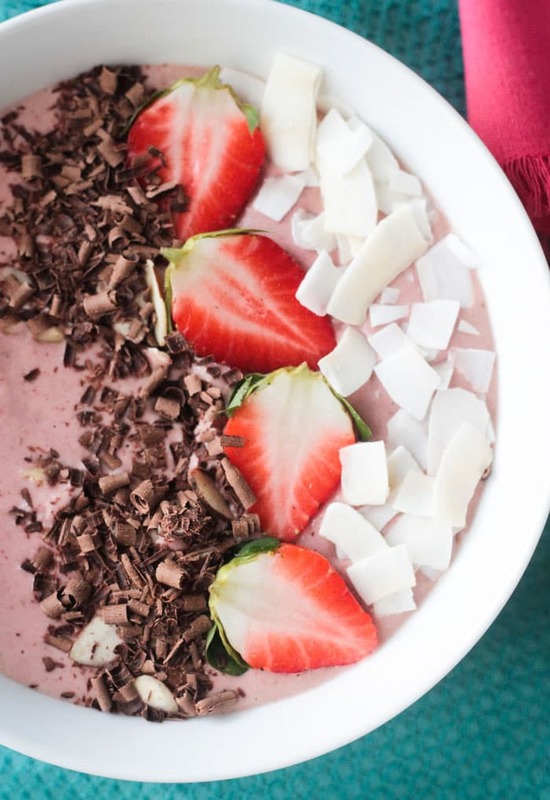 I love a good smoothie bowl and love the strawberry chocolate combo! Thanks, Sarah! Smoothie bowls are so much fun to make! Those chocolate and coconut shavings make me swoooonnn! What a gorgeous and tasty smoothie bowl! This sounds so delicious! I love that you’ve used cashew butter & oats for thickness. I usually go with frozen banana, but I’m not always in the mood for banana. This sounds like a delicious alternative – plus extra protein! Thanks, Cadry! Frozen banana would be awesome too. This looks amazing, Jenn! I love chocolate smoothies for breakfast! This smoothie bowl needs to be in my life asap! Love everything about it! Chocolate and strawberry are one of my favorite flavor combinations! One of my favorite combos too! Thanks, Taylor! Gosh I just want to dive into this with a giant spoon! Such a great blend of heart healthy ingredients to enjoy this season! Thanks, Liz! Dive right in! One of my favorite things about smoothies is how they can taste like dessert and still be super healthy! Yes, totally agree! Thanks, Maria! This looks so good! I am smoothie bowl obsessed. Must. Try. They’re so good, right? Reminds me of eating a bowl of ice cream….but healthy! Yummy! Perfect for today but like you said, anytime because who doesn’t want a chocolate covered strawberry snack all the time? This looks like such an indulgent breakfast! How fun does this look?! An awesome way to enjoy chocolate covered strawberries for breakfast! This looks so good! I love chocolate in my smoothie bowls. you had me at cashew butter! I love trying different nut butters, they are so yummy. Great valentine’s inspired day! Oh, I’m obsessed with cashew butter! You’d love this! Thanks, Amanda! I still haven’t jumped on the smoothie bowl train, because drinking it from a straw is so much easier! LOL! BUT this flavor combination sounds amazing and might make me a bowliever.